I feel like writing the lyrics for a song for the famous American rock singer Axl Rose and ask him to render it to Sri Lanka cricket. Right now the Lankan cricket is between guns and roses. Just to elaborate a little, the financial roses have begun to bloom for the beleaguered cricket administration after reeling in a crisis for the past 15 months or so. Thus let the roses be on hold. It’s the guns which are firing have become relentless. They are aimed from many a direction. The episode on the gun is a direct result of politics getting into sports or sports getting into politics. The situation is so complex and now we cannot tell if it is the egg or the chic that came first. First we can take up the tragicomedy on the board elections. The story began years ago. The story could be converted into a successful ‘soap’ even better than the American super hit – the Dynasty. However, in this episode there is more than one Blake Carrington. The crux of the matter is the feud between two of the most powerful Lankan business families along with another family which has a finger in every cricketing jar in the country. The episode has continued without a break for the past quarter-century. Do you remember that in 1995 Ana Punchihewa became the President of the Board of Control for Cricket in Sri Lanka? At that time the two vice presidents were Upali Dharmadasa and Thilanga Sumathipala. The Lankan cricket captain was Arjuna Ranatunga and the Sports Minister was S.B. Dissanayake. Then by 1996 the Lankan train of thought changed along with its approach to cricket. Then with the slogan ‘The best cricket playing nation by the year 2000’ Sri Lanka proved their mite by winning the Cricket World Cup – beating Australia in the final at the now international cricket forbidden city of Lahore in Pakistan. While the cricketers were busy shaping themselves up for the World Cup, back home the Lankan administration was building their strategies for the next annual general meeting. Ana Punchihewa was more than mildly surprised when his closest lieutenants – Dharmadasa and Sumathipala broke camp to contest against him – just a few days after Sri Lanka had brought home the greatest achievement in cricket history. At that juncture Arjuna Ranatunga, Thilanga Sumathipala and S.B. Dissanayake were good friends and they backed Dharmadasa to the chair and helped him to beat Punchihewa by a whisker. Punchihewa became history and Sumathipala once again was the vice-president. Dharmadasa completed his two-year term. Sumathipala won the elections in 1997 and became the president of the cricket board. The go-getter he is, Sumathipala promptly converted the Board of Control for Cricket in Sri Lanka into Sri Lanka Cricket. 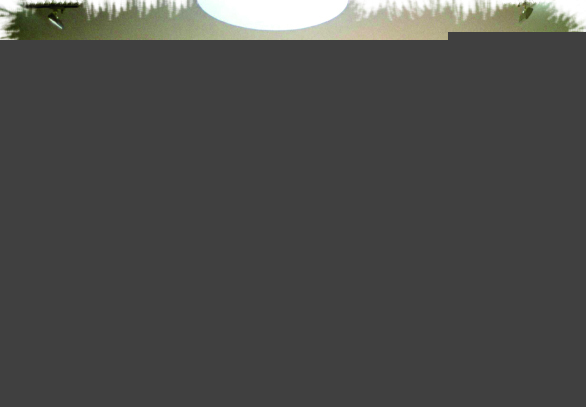 There was another change. The eldest of the Ranatunga clan – Dhammika became the Chief Executive Officer of Sri Lanka Cricket. Still the cricket captain of the Lankan team was Arjuna Ranatunga. In 1999, for the defence of Sri Lanka’s world cup the captain was Arjuna Ranatunga, the SLC President was Thilanga Sumathipala and the Chief Executive Officer was Dhammika Ranatunga and the three friends were together in England. However, the World Cup defence was a disaster and this saw Sumathipala and subsequently Ranatunga being removed from their posts and the first Lankan Interim Committee under banker Rienzie Wijetilleke being formed. That interim committee duly completed its short stint and made way for elections. At this point Upali Dharmadasa’s elder brother and business tycoon Jayantha wanted to make his mark in cricket and decided to contest along with running mate Clifford Ratwatte – a close relative of the then President Chandrika Bandaranaike. By this time Thilanga Sumathipala had built an impenetrable fortress round the Lankan cricket stakeholders. Then in 2000, Sumathipala was back in the saddle after a controversial election full of drama. That was the end of the Dharmadasa-Sumathipala partnership. But, this time ironically, the Ranatunga-Sumathipala association also went awry over an intellectual property disagreement. This development saw Dhammika losing his job as the CEO and Arjuna beginning to get involved in Lankan cricket administration. Arjuna Ranatunga – the 1996 World Cup winning captain — tried his hand once to test his wits against = Sumathipala, but the latter’s loyal stakeholders paid their dues by rallying round him once more and Ranatunga was left with only a handful of votes. Ranatunga then joined politics and became Sumathipala’s nemesis. Interim Committee’s became the trend of the day and they came in various phases with many different faces. Jayantha Dharmadasa took over as Interim Committee Chairman in 2005 ousting the Thilanga-backed presidency of Mohan de Silva and held the reins till December 31, 2007 when Arjuna Ranatunga was given the political nod by President Mahinda Rajapakse to take over.Ranatunga held the position for barely a year and was removed by the then Sports Minister Gamini Lokuge. By this time, the so many government-controlled administrative bodies in ICC full member states like Sri Lanka and Pakistan had become a bother to the world body. It instituted some stipulations and gave an ultimatum. By this time Upali who was in hibernation for almost a decade and a half was brought back as the last Interim Committee president before reverting cricket to the stakeholders. At the same time the Lankan Sports Ministry called for elections a little over a year ago. Yet, what transpired was Upali once again got the nod from where it matters and this time subdued Thilanga to the level of withdrawing his nomination and became the all-conquering uncontested president. However, even at that time we learned through the grapevine that the next of kin for this post would be his brother Jayantha and that too would come on almost a platter in spite of Sri Lanka having to go on stakeholder elections and that would be done with transparency. When the time was ripe, Sports Minister Mahindananda Aluthgamage asked all sports bodies to go in for elections before March 31, but not before he also made some changes to the eligibility of contenders to the respective posts in the bodies. Jayantha Dharmadasa the main contender who has not played first class cricket or being a member twice in the SLC committee within the last fifteen years duly obtained special permission from Sports Minister Aluthgamage. However Sumathipala, a ruling party MP, who once bowed his head to one Dharmadasa was not going a bow to another. He worked his way through another ladder in the same camp. When the nominations were to be handed over, Jayantha feeling stiff resistance from the Thilanga camp withdrew from the race, but with the golden goose still in his possession. By the time the nominations were handed Thilanga already had objections filed against him. Upali fearing that no one would oppose Thilanga after he had learned that his brother had not forwarded his nomination handed his one over, but without proper clearance. The Third candidate Sumith Perera, a well-known Dharmadasa loyalist, who was also not eligible in the eyes of the prevailing Sports Law of the country, handed over his nomination. When once the Sports Minister wanted to announce the findings of the committee which he had appointed to probe into the eligibility of the respective candidates and was about to nullify all, there was a protest from the Thilanga camp and the matter was referred to the Attorney General’s Department. 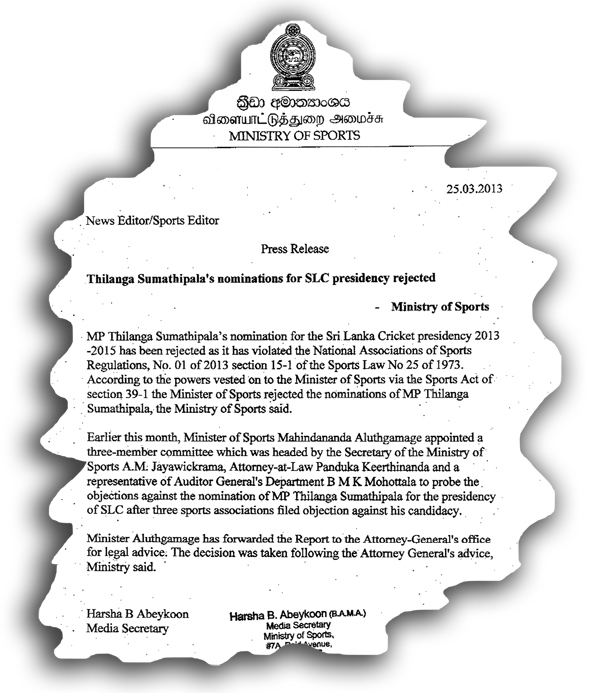 But, finally early last week the announcement was made that Thilanga was not eligible according to the Sports Law. With Upali and Sumith also ineligible, the SLC ex-co met on Thursday evening to recommend someone to take over the candidature. Then the only person above the surface was Jayantha Dharmadasa. Without becoming a great subject within the past few weeks on the board elections, he managed to outfox the entire cricketing world. He well knew what was brewing around him, but he waited with patience bigger than his own hospital Nawaloka and like we said in our sports pages recently — had the last laugh. The SLC executive committee gave him the green light and now he is once again at the helm and again this time also like the last democratic election — no opposition. PS: More episodes to follow.